A flashback reveals a conversation between the Flash and Iris West, in which he makes a promise to stand up to Superman, should he turn evil. 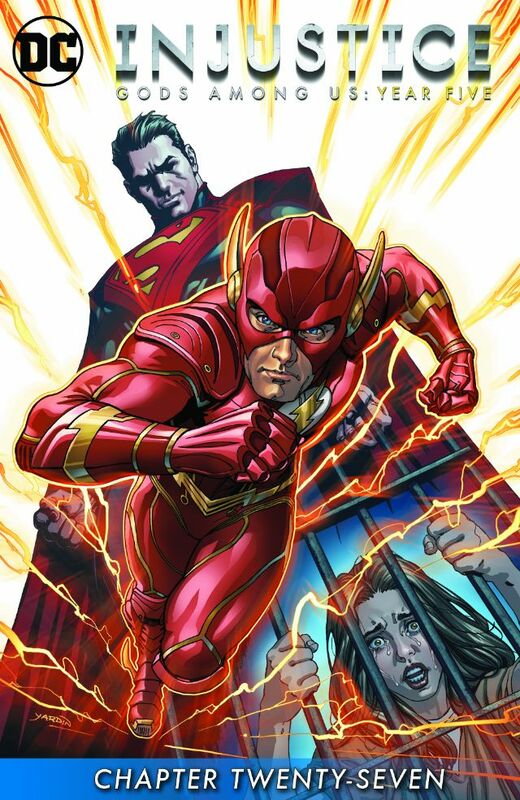 The present shows Regime Superman throttling Flash in anger, for his part in helping the Batman to escape. After being attacked by Superman, Flash heads off. He tries to connect with Iris, but that doesn't take. Villains show up later, and, of course, Iris is there. Story - 2: Why is the Flash still alive? He betrayed Regime Superman, allowed the Batman to escape, why isn't he dead? Shazam was killed for less. Martian Manhunter was killed for less. Flash is a full-blown traitor, and he's alive because...? Forget the contrivance with Iris West, the fact that Flash is alive, even after taking a punch from Regime is exasperating. Why are these sort of sequences written, when Buccellato knows full well that they cannot be executed? If we know that certain characters cannot be harmed or killed, because they are player-characters for the video games, Buccellato should refrain from engaging them in such a sloppy manner, and an unsatisfying one at that. One last note, Regime Superman was at one point a very entertaining villain. Now he's a two-dimensional loser, akin to most cookie-cutter bad guys. If given enough time, we'll see him stroking his mustache as he reveals his master plan, then cackle loudly in evil delight. Oil Can Harry provided more substance and threat than this B-level Ultraman wannabe. Art - 4: Tom Derenick has been the best artist, and many times the best thing about Injustice, and this issue is no different. He actually makes the Flash look imposing while next to Regime, Wonder Woman, and Cyborg. That's saying a lot. Cover Art - 5: Who'd win in this race?